What Are My Options If I Have Wrecked My Car? I talk to hundreds of people each week that have been involved in an automotive accident and want out of their car. Smart consumers do not want a wrecked car even if its repaired perfectly. Insurance companies generally tell their customers they are responsible to repair the car to "pre-accident" condition. This is the agreement they have with their customer, generally called an insurance policy or binder. When I’m talking to consumers the question always arises; Is it really possible to "restore" a vehicle to pre-accident condition? The answer is a resounding NO. Even if your truck or car is repaired with absolute precision by human hands, there’ll be inconsistencies and/or flaws. The welds won't be done by the assembly line robots and the parts will not be dipped in the proper metal baths…More importantly your car or truck will never have the same value it did before the accident mainly due to the accident history. When your car’s repair estimate is performed, ask the body shop for a digital copy via email along with the pictures (images). That can be shown to additional collision shops that may offer to repair your truck or car for less money. More importantly, you may discover that your insurance companies estimate is low and you need more money to get your auto repaired to "pre-accident" value! Always receive a cash offer for the damaged car "as-is". You can call 720-279-0229 or email the repair estimate to brettmorton@coloradojunkcars.com and our dedicated car buyers will respond quickly with a cash offer that includes us towing it away. Many times it makes sense to keep the repair check and you’re your wrecked car or truck "as-is". Remind your insurance adjuster that you’re the customer. Especially since you have been loyal to their company. Remind the adjuster how many long you have been with the company. You might get a little more cooperation if you inform them of the possibility you may switch companies. There are over 65,000 collisions per year in the US alone. Only half of them have coverage and are consequently repaired or totaled. Most consumers just want "out" of their vehicle after a wreck. Think about how many television ads you have to watch and how many of them are insurance companies vying for your business! Ask yourself if they would be doing that much advertising if their business was not profitable? If you've just had a wreck and you too do not want to keep the vehicle, call ColoradoJunkCars.com. 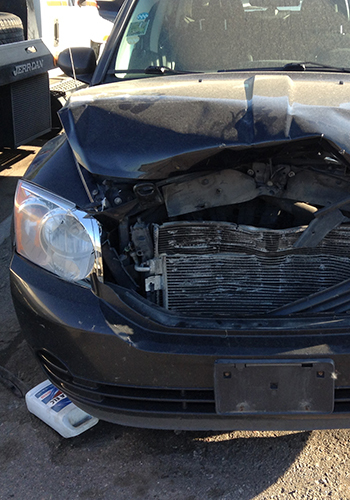 We buy damaged cars and trucks throughout Denver, in any condition. For more information, call (720) 279-0229 to speak to local car buyer. Consultations are always free and could be very beneficial.